Successfully Added MP3 Player Sunglasses with Stereo Sound (2GB) to your Shopping Cart. Looking cool is what all men are about, so why not do it in style? 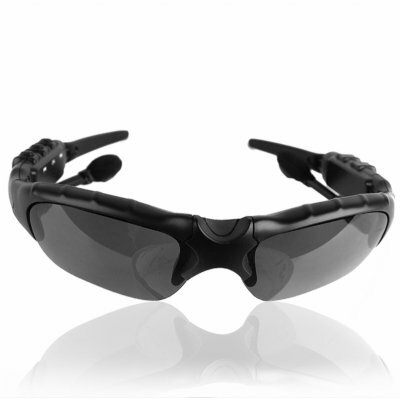 Now you can, and while listening to music, with these hot MP3 Player Sunglasses with 2GB memory. These WMA + MP3 player sunglasses come with 2GB of flash memory (enough to store a large music collection) and provide you with exceptional stereo sound through the built in high quality earphones. Simply put them on, and presto, these cool looking MP3 shades will provide you with the flexibility of listening to you favorite music with style, convenience and ease. Designed with the user in mind, these MP3 sunglasses come with swiveling and extendable earphones, meaning they will fit any face and nose. Furthermore, with the flip up glasses design, you won't even have to take the sunglasses off in low light situations. Altogether with these sunglasses a hard case and lens care cloth are included, which means finding your sunglasses easily and keeping them in great condition have never been so simple. These popular WMA + MP3 sunglasses are available in stock now, and are the perfect product for resellers and drop shippers. Click "Add to Cart" now and let us ship out a sample tomorrow to make you feel the amazing awesomeness of these super cool high tech sunglasses. Then list them on your webshop using your own experience as a firsthand review of how good the product really is! No, there is no Bluetooth function. on 2011-07-28 15:03:41 my 1st buying..
just ordered... waiting for arriving... don't have that passion..